This is a dish that quite honestly does not need a recipe….does that make sense? I am trying to say that this is such an easy dish that just needs very little cooking skills. Using one of the most favoured ingredients in the house to create a mouth-watering start of the day meal – breakfast or brunch. 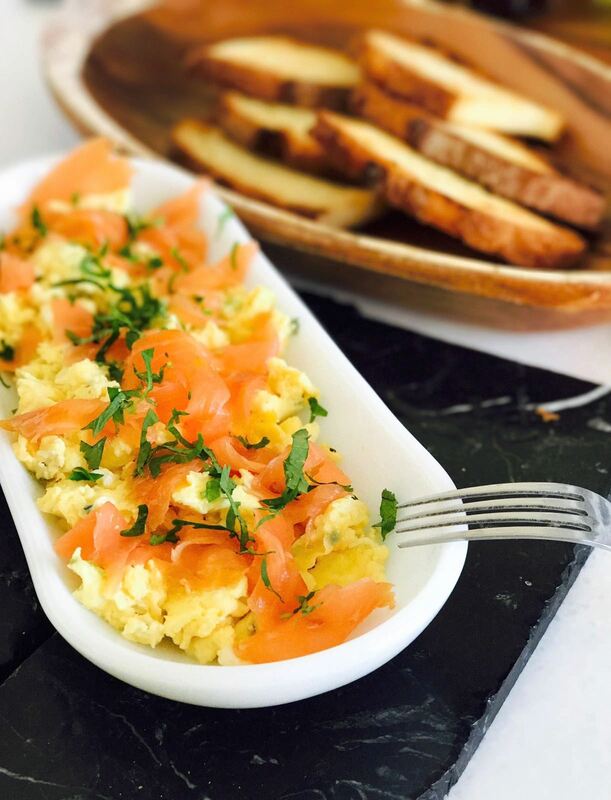 Silky cooked eggs with a few herbs and this time with smoked salmon will certainly wow your family or guests anytime. A good way to also use any leftover smoked salmon or rather salmon trimming over the festive period. A luxury breakfast at low cost. Chop the salmon into crunchy pieces, set aside. Chop the herbs and set aside. Whisk the eggs in a bowl, add the milk/cream and season with salt and pepper. Add the chopped herbs and mix well. Pre-heat a large skillet; add the butter and a little olive oil over a moderate heat until it melts. Whisk the eggs in a bowl and add to the skillet, using a wooden spoon or spatula stir the eggs continuously to avoid sticking to the pan. Bringing all the mixture from around the edges to the middle to ensure thorough cooking. When the egg start to turn opaque and white however still a little runny, turn the heat off and add half of the chopped smoked salmon. The egg will continue to cook on the hot pan, mix all and add the chopped coriander. Remove from heat, scatter with the reserved salmon and garnish with more coriander. You can add more black pepper. Serve warm on toasts or griddle bread. Brinda’s Note: If you don’t like cheese please omit.